Kahmann Sense – Let the School Year Begin!! Well, summer is coming to a close – how do I know that?…because school starts this coming Wednesday – Woo-Hoo!!! I’m not sure I’ll ever get used to school starting in mid-August, back in the day (when I was a youngster) school started around Labor Day and ended around Memorial Day – aahhhh, the good ole days!! 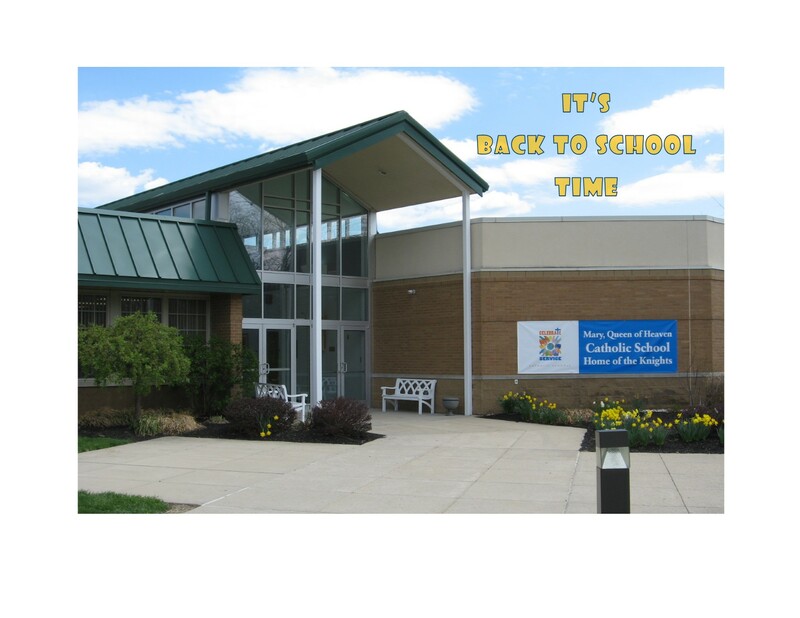 I’m always excited at the start of a new school year – I can’t wait to hear what the kids did during the summer!! There’s a surge of enthusiasm from the students at the beginning of the school year, especially from the little ones – they always put a smile on my face. Nothing in the world brings me greater joy than ministering to our students and teaching them our beloved Catholic faith – it’s an extremely important part of what I do. I can’t wait to preach to the kids at school Masses and eat lunch with them and go on field trips with them. Let the school year begin!!!! Speaking of school Masses – there’s going to be a change in our daily Mass times once the school year starts. Some of our 8th grade students have the opportunity to take an Algebra class at St. Henry High School. The class starts at 7:30am and ends at 8:15am. Our daily Masses start at 8am. Our school Masses are on Tuesdays and Fridays and I want all of our students in attendance. SO, BEGINNING FRIDAY, AUGUST 19, 2016, THROUGH FRIDAY, MAY 26, 2017 – ALL MASSES ON TUESDAYS AND FRIDAYS WILL BEGIN AT 9AM. THERE WILL BE NO 8AM MASSES ON TUESDAYS AND FRIDAYS. Masses on Monday, Wednesday, Thursday, and Saturday will remain at 8am. To make it easier to remember – there are no exceptions. So for instance, if school is called off on a Tuesday because of snow – Mass will still be at 9am. Or if a holiday falls on a Friday and there is no school, Mass will still be at 9am. Once school is out for the summer (the last day of school is Friday, May 26), Tuesday and Friday Masses will go back to 8am. If anyone has any questions, just ask me. Monday, August 22 is the Feast of the Queenship of Mary – that’s a BIG deal to us since our parish is named Mary, Queen of Heaven!!! I can’t think of a better reason to have a party – so we’ll be celebrating our patroness feast day next Sunday, August 21 from 4:30pm – 7:30pm. It’ll be on the front lawn of the school under the great big tent – so you can’t miss it. The parish will provide the burgers, hot dogs, metts, etc. and all of the drinks and you-all can provide the side dishes and desserts. Be sure to bring the kids because there’ll be plenty of games for them to play. Our get-together will be a great way to say “Thank You” to the Blessed Virgin for always guiding and protecting her parish. Mary, Queen of Heaven, pray for us!!!! We have some new pamphlets about our Catholic faith on the tables in the narthex so stop by and check them out. They’re on a wide variety of topics – some of the titles include; “Top 10 Questions Catholics Are Asked”, “10 Things That Make for a Great Catholic Family”, “The Bible and You”, “How to Get More Out of Mass”, “End of Life Issues” and many more. Give them a look – you just might learn something! !